The loss of one or more natural teeth can negatively impact a person’s life in various ways, from the kinds of foods they’re capable of chewing to their sense of self-confidence when posing for a photo with friends. At Michel Dental, our talented team of doctors wants to help you explore every possible way to bring back your complete smile; we offer several different services with their own unique advantages so that each treatment plan is comprehensively personalized to best fit a patient’s goals and preferences. Contact us today to schedule a consultation in Topeka or Silver Lake, KS. Why Choose Michel Dental for Tooth Replacement? Dental bridges are sturdy, customized prosthetics that we design specifically to “bridge” the gap left by consecutive missing teeth. Traditionally, they are held in place with the balanced support of two dental crowns – one is placed on either side. In today’s modern dental landscape, though, implants are the clear preferred option for anchoring, as they’re more conservative and do not require any existing dental structure to be altered or removed. 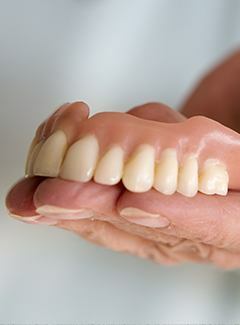 When a larger number of natural teeth have been lost (or even an entire arch), a personalized full or partial denture can provide comprehensive coverage at an affordable price. 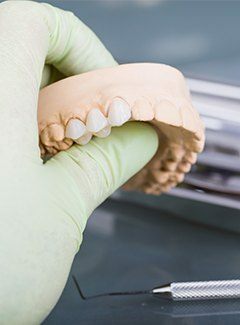 Many patients still enjoy the convenient, removable nature of traditional dentures, which rest atop the gumline and stay in place through the use of natural suction and/or strategic clips. At Michel Dental, we also offer implant-retained dentures as a stable, more permanent alternative that supports oral health while also providing optimal function. While every patient’s needs are different, our dentists are most likely to recommend dental implants as the premier solution for tooth loss. 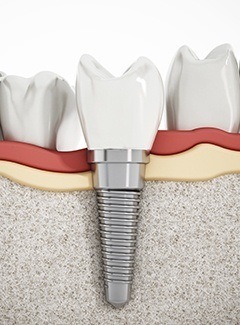 Unlike more traditional prosthetics, implants specifically replace the root of the natural tooth first, which establishes an enduring foundation while also preserving jawbone health. Then, this new “root” is fitted for an attractive, all-ceramic restoration, and the final result is practically indistinguishable from the original dental structure in appearance, durability, and day-to-day function.